Over the last few weeks, we’ve talked about several ways you can make your wedding day unique and unforgettable. We’ve thrown out old traditions of hiding from the groom on the day-of, uniform bridesmaid dresses, and even the white wedding gown. But, no matter how much you customize and plan, some things will just always be out of your control. Take Janelle and Joshua. 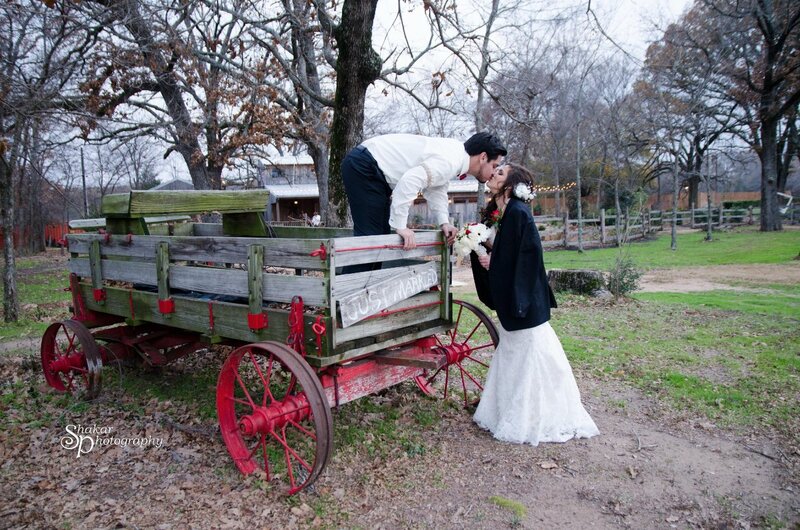 They got married on December 14, 2013 not too far from Dallas at the Stone Oak Ranch in Murchison, TX. As my fellow Texans know, temps are usually pretty mild at this point. We always hope for a “white” holiday season, but we almost never have one! So, you can imagine Janelle’s disappointment when days before the wedding we experienced a three-day ice storm that coated everything. When the wedding day arrived, ice was still covering the venue grounds, and the roads, it was nearly impossible to keep warm. It was only 20-25 degrees out! But, she didn’t let the bad weather get her or her guests down. Its a good thing she was already prepared for a cold wedding, she now just had to turn it up a notch to accomodate for freezing weather!! As the guests walked through the door, they were greeted with a hot chocolate station equipped with all the fixings. 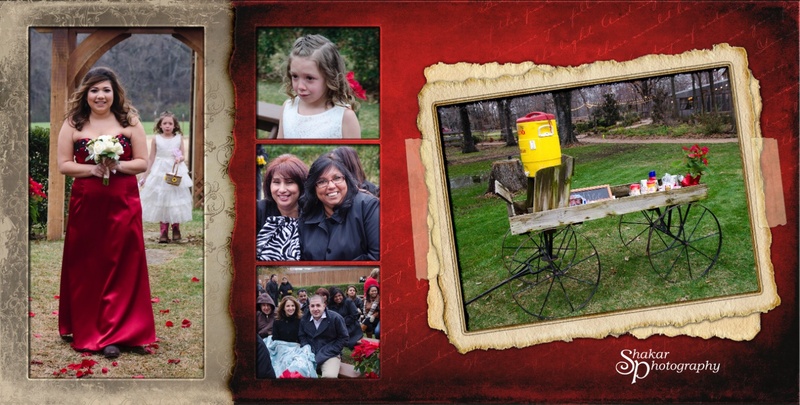 Everyone sipped their drinks throughout the wedding, keeping warm and full of holiday spirit. Janelle and her bridesmaids had already planned on keeping things rustic (and warm) by wearing cowboy boots the whole day. They even wrapped up in blankets and had extra fun with the photos. 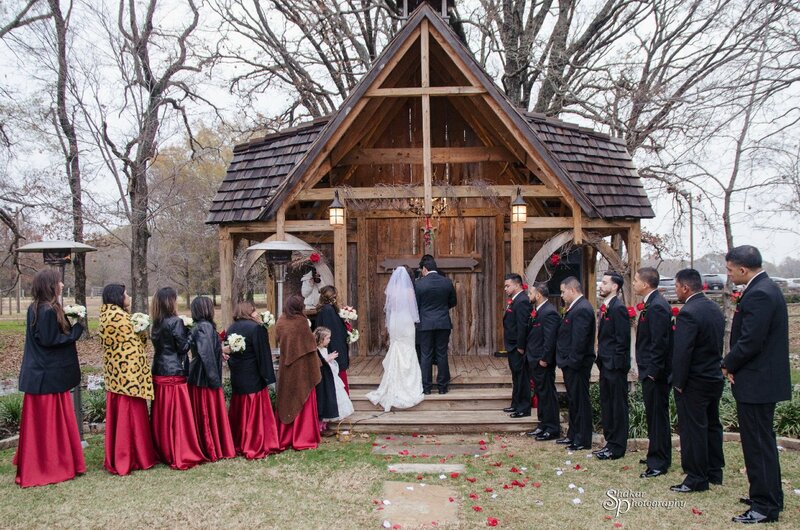 During the ceremony, two space heaters were positioned near the alter to keep the entire wedding party warm—especially the girls and their bare shoulders. 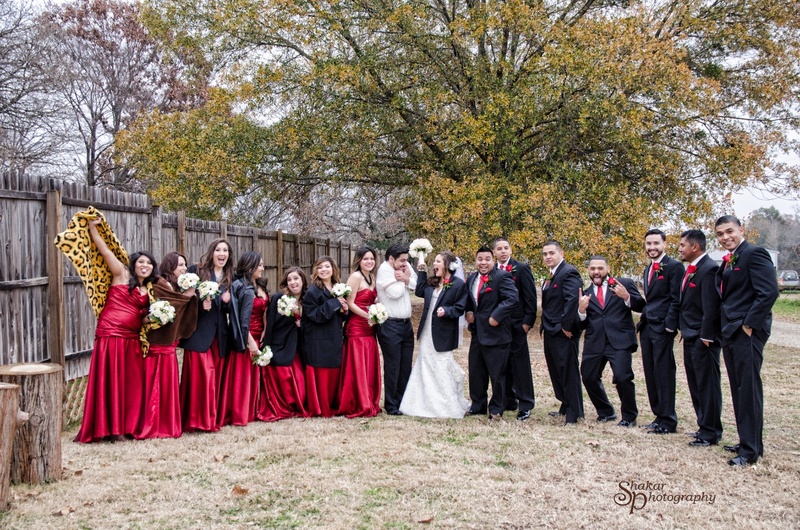 All the bridesmaids grabbed either blazers from their significant other or even their childs blanket, whatever it took to stay warm! All the guests continued to sip on on hot chocoloate and cuddled up in winter coats and blankets as they toughed it through the hour long ceremony! As the photographer, I too was doing the best I can to stay warm, while I struggled to keep my camera working through this crazy weather! I must have gone through several dozen batteries that day trying to keep my flashes working! Even my camera batteries kept dying and I was constantly running to an outlet to recharge, but somehow I still got every important moment on camera, and some fabulous photos overall from this wedding. During the reception they improvised yet again with a bonfire for the guests. They provided graham crackers, chocolate, and marshmallows for s’mores, and everyone kept warm and full of chocolate! This was definitely one of the most unique and beatiful venues I have had the pleasure of photographing a wedding at. The whole wedding from start to finish was just well thought out, gorgeous, and the staff and coordinators were great to work with! 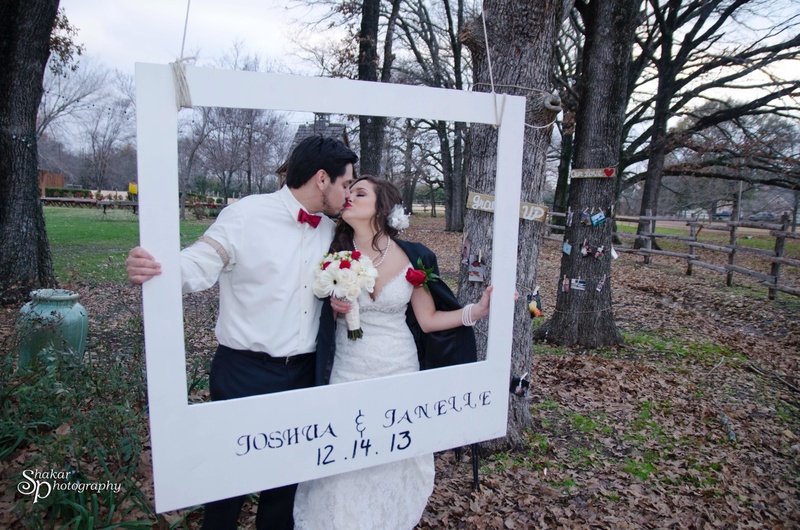 Though Janelle and Josh would’ve preferred a little warmer weather, they ended up having a fabulous, freezing but cozy wedding that everyone talked about for weeks. Plus, we got some really fun photographs out of the situation! I hope that the weather is perfect for your big day, but I encourage you to have fun with any unexpected surprises you may encounter. Let your wedding be the best day of your and your fiancé’s lives, no matter what happens. Get creative! When you embrace the hiccups, you make room for even more memories and unforgettable moments!